The Alexander McQueen website shows a stripped-down, wearable, moderately priced version of his style. The site is meant for modest consumers, and I can't help but imagine how little the man would like it. “Nicey nicey just doesn’t do it for me,” McQueen said once, and reading about his fashion shows, I'd believe it. Today's style is inspired by the RTW site, using McQueen's blocky lines interpreted through an outfit by Anya Ohmai. With the help of some friends, I'm posting a week-long series inspired by Alexander McQueen. I think he would've loved Second Life, especially reading this about his style: "The models appeared to be brutalized, wearing lacy dresses with hems and bodices ripped open, their hair tangled and their eyes blanked out with opaque contact lenses." (Source) Heck, I think I saw that in Putrid Gloom's sim just last week. I've begun gently, however, and hope that the rest of my guest-bloggers take it to the extreme! Fauns and Vixens and things with more legs than two! Read all about it on Day 19 of silentsparrow month at Dressing in Pixels! This morning I spent a good five minute staring at my avatar, wondering what kind of tabletop roleplaying game she'd stepped out of. She's an elf, so definitely high fantasy. The Book of Shadows strapped to her thigh makes her a mage of some kind -- wizard or magician. The jeans, though… Post-apocalyptic fantasy, or urban setting. A friend suggested Shadowrun, but I'm thinking The Shadow of Yesterday, or maybe the most awesome indie Enchanted Tales system. *cough* Ah, sorry, my geek was showing. Anyway, the collar is new from Plastik (SLURL), and one version of it straps on to keep your neck WARM, NO RLY. 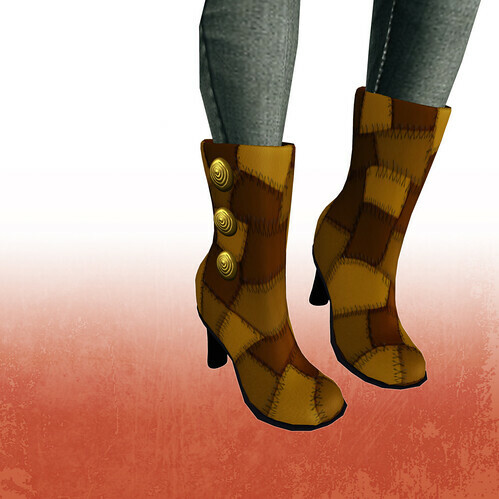 The hair is long and roleplay-riffic from Calico Ingmann Creations (SLURL), and the gorgeous patchwork boots are new from Lassitude & Ennui (SLURL). There is a new male skin at Nomine named Noam. (Go see it for yourself at Nomine). Ahoy there! Achariya has allowed me to hijack her blog to share mine. She's lovely, you know. We meet in my middle of my (almost) month-long silentsparrow extravaganza on Dressing In Pixels. Come and look! I should warn you though - I'm wordy. Happy Mardi Gras, y'all! Last weekend at work someone brought in a King Cake, and I was shocked to hear how many people in Orlando didn't know what it was. I suppose we are a good ten hour drive East of New Orleans, but I thought Southern culture encorporated some of this… I guess not, eh? For those who don't know, it's an apple strudel made festive by a sprinkling of colorful rock sugar over the top. Within, there is a baby or a coin hidden, and it brings luck if you find it. I hope you all have your own ritual on this day, one final celebration before Lent. Skin by Ugly Duck. 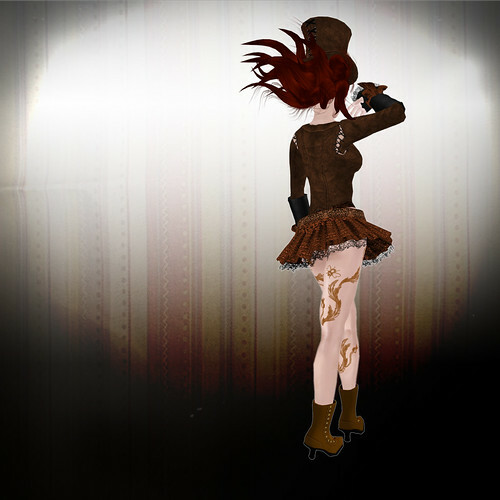 New outfit by ~silentsparrow~.